We had a party last night--the kind with about 80 people and lots of standing around talking, eating and of course drinking wine. Finding good wines to serve at parties is always a bit of a challenge, because you need to find a wine that is affordable, that suits a wide variety of palates, and that doesn't require food to be at its best. I set a strict under $10 limit for party wines, and usually head over to a wine superstore like Beverages and More to make my selections. For most parties I stick pretty much to pinot noirs from New Zealand and Sauvignon Blancs from California or New Zealand. This time, though, I went a bit mad and decided to get chardonnay and sauvignon blanc for the white wines, and two red blends because I just couldn't find an affordable pinot. But I did find four wines that promised to have good QPR or very good QPR. 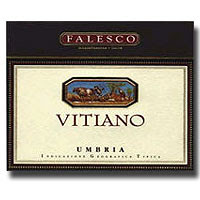 I ended up with the 2004 Falesco Vitiano ($9.99, Beverages and More; even less elsewhere, like Wine Library). Made from equal parts of sangiovese, cabernet sauvignon, and merlot it has received high marks from critics, but mixed reviews from consumers. Still, I thought it would appeal to folks who loved cabernet, but be a little softer and less in need of food to drink well. I was right, and people were drinking this down with great enthusiasm. I didn't get a chance to drink a proper glass and think about it, but will post a full review in the upcoming weeks. My other red choice was the 2005 Rosenblum Chateau La Paws Cote du Bone Rhone ($9.99, Beverages and More), a red blend of 98% Syrah mixed with touches of petite sirah and zinfandel. I love syrahs--so drinkable, so lush tasting. From my brief encounter with this wine last night it was very juicy and fruit forward. A bit simple but very quaffable, which is what you are looking for in a party wine. I think this would be excellent with bistro fare, like burgers, rotisserie chicken, and French onion soup as well as your Friday night pizza. For the whites, I picked up the latest release of the 2006 Pomelo by Mason Cellars ($9.99, Beverages and More). I reviewed the 2005 Pomelo in November, and this wine was consistent with its grapefruity flavors and aromas. Definitely a hit, and its Stelvin screw-top closure made it a great wine for a party. The other white was definitely most popular among the dedicated oaky chardonnay lovers. The 2004 Buehler Chardonnay Russian River Valley ($9.99, Beverages and More), was bright gold in color, with aromas of smoke, pears, and apples. There were proncounced oaky flavors, tempered slightly by ripe pear and a barely discernible rocky taste, which was more apparent when the wine was cool. As it warmed, however, the oak took over. It was my least favorite wine, but it was a big hit among the Chard Brigade. Parties are a wine challenge, but it is possible to serve some good wines like these without breaking the bank. What do you serve at your parties, and how do you figure out what types of wine to buy? Leave your comments and suggestion since I still think I could do a better job finding wines that are more interesting and get people talking about the wine, and not just drinking it. The Vitiano is a neat choice for a party wine, as most people go straight to Aussie shiraz. Actually finished that bottle tonight, party of two. I have a post in edit mode that I never got to finish regarding party wines - I guess I will save it for next year...Cheers! Hi Joe. Sorry for the slow response, but I've been felled by the flu. Glad to know that you liked the Vitiano--something else to look forward to once my palate returns to normal. And the world can't have too many party postings as we start approaching spring, bbqs, graduation, etc. etc. I think the Vitiano deserves every bit of praise the critics heaped upon it. It's one of my all-time favorite wines. My guess is some people are fooled into thinking it's average by its average price. Rosenblum's Chateau La Paws donates $6 per case to a national charity, Paws With A Cause. The charity trains service dogs for people with special needs. It's nice to know that the winery gives back to a cause. Welcome, Justin. I think a lot of people don't like the Vitiano because of the licorice notes that they find are "bitter". I find them fabulously interesting. And thank you Anonymous, for the heads up on the donation program that Rosenblum has. What a great cause, and it's nice to know that the folks at Rosenblum are donating to such a worthy endeavor. Interesting thought about the licorice. I think it's the licorice notes that make the wine interesting. Couldn't agree more, Justin. But a lot of people react negatively to the unfamiliar, and consciously or not expect everything they drink to taste like a cabernet. It's one of the reasons I'm such a big believer in getting to know varietal characteristics. It's one thing to criticize a wine for not tasting like a good sangiovese blend when that's what it's supposed to be; it's another thing entirely to criticize a sangiovese blend because it doesn't taste like a Napa cab!